Swagbucks is my latest thing. I think I’ve been doing it for about two weeks and I already have 687 Swagbucks. What are Swagbucks, you ask? Well, I first heard about it from Katy Wolk-Stanley over at The Nonconsumer Advocate. Basically, you create an account and then the website has all these ways for you to earn Swagbucks, which you can then cash in for things like Amazon gift cards and Visa gift cards, with a ratio of 500 Swagbucks = $5, usually. You can answer surveys, watch videos, view offers, or even just use their search engine for your Internet searches. If you already spend a fair amount of time on the computer each day, like I do, it’s easy enough to use their search engine and to play the videos (and then not watch them; I’ve got one running right now. Unless you care about Beyoncé’s vegan eating plan or why Robin Williams’ widow is suing his children). I’ve been doing surveys at night while I watch TV. Last night, I started a survey about what sneakers do you buy your kids, and midway through it asked to ask my son questions. So when my husband came home, my son and I were sitting there while my son tried to decide if he associated Skechers with “cool,” “popular,” and/or “exciting.” “Are you sucking him into that Swagbucks thing? !” said my husband. Ha! Usually, however, the surveys stick to adults. It’s a little tedious, but it’s real money. I don’t enter sweepstakes or play the lottery — I won’t waste money or time on something that’s just a chance. But I’ll do coupons, Box Tops, Swag Bucks, all the live long day, because the payback, while small, is real. I’ve got money on the brain (more than usual) because a lot of expenses are starting to materialize. I just bought my bridesmaid dress for my sister’s wedding, and also booked a hotel room for it. I put a deposit down on a house in upstate New York for my cousin’s wedding in September, where my family and my siblings are going to stay. On Monday, a fence guy came out and gave us an estimate, because I’m back on the dog kick, and I’d need the back fence replaced to get one. Not to mention that just to adopt a dog would be around $350. And then there’s the question of the McGuire family vacation — where, when, how long? But in the midst of these long-term plans, it was just another chilly week. 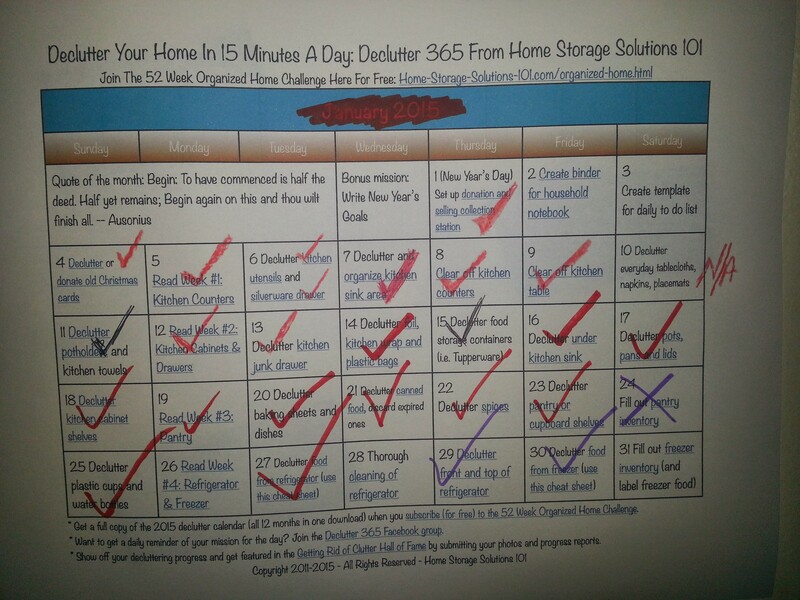 Tuesday, I wrapped up the January decluttering challenge by cleaning out the freezer. There was a lot of crap in there, including not one but three different ice packs for my husband. I used the frozen bananas that were in there to make banana bread, and used frozen tomatoes from the garden to make gravy. It was fun; my daughter helped me make the bread and then devoured several (crustless) pieces when it was done. My younger son liked it too. The freezer is much emptier now. All those stupid bagels I got for free that nobody really ate (they weren’t that good) are gone now. A nice day all around: I stayed off the computer and played with and cuddled with my daughter a lot, and let her pull every single pillow and cushion off the couch and jump on them. So the February challenge is printed out and hanging on my wall. 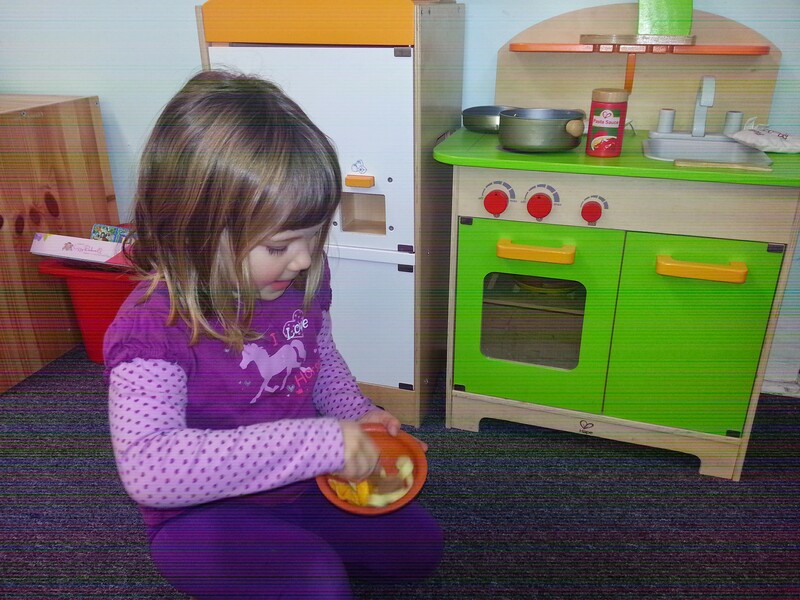 It also focuses on the kitchen. 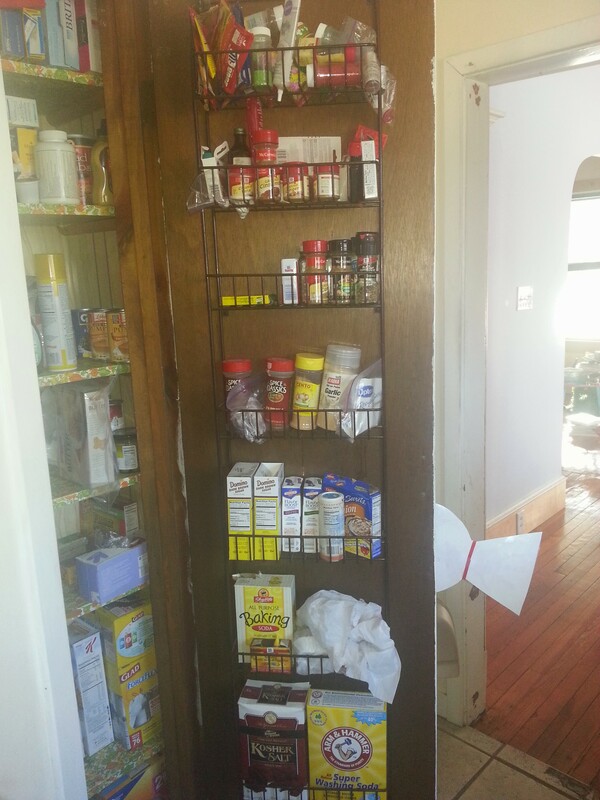 Thursday I decluttered my recipes, but I didn’t go as far as to create a whole new recipe organization system, as the challenge calls for. Too much to think about. But all in all the kitchen is in great shape. I even have been washing out and reusing a lot of large Ziploc bags and plastic and glass food containers, so that I can avoid buying new Ziplocs and Tupperware. 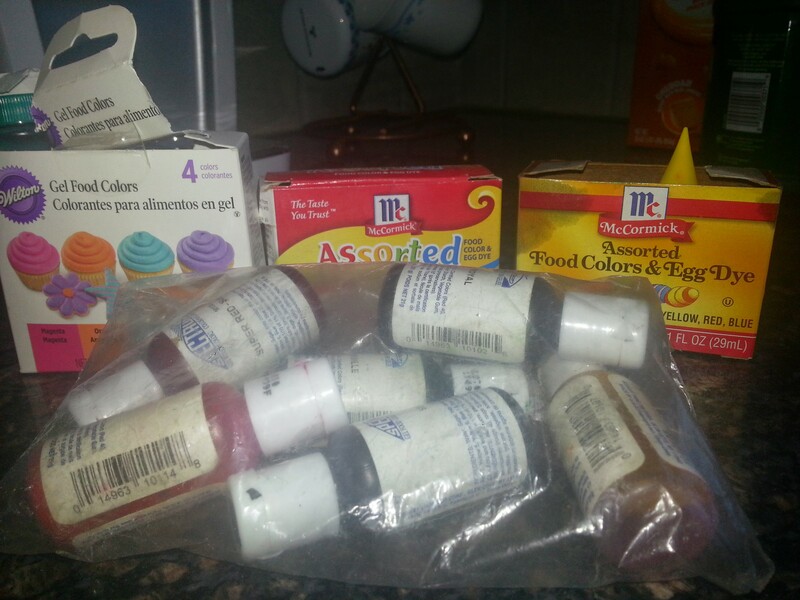 Why do I have this much food coloring?? Monday we had French toast (with hidden sweet potato) and bacon for dinner. Tuesday, I ordered Thai food for my husband and me, because I decided the gravy needed more time to cook; Wednesday was spaghetti and meatballs and garlic bread using rolls dug out from the freezer; Thursday was quesadillas and black bean dip with tortilla chips (recipe at bottom). We got to see a lot of family this week: my parents came over with my nephew on Monday, and my in-laws came to visit on Wednesday, for the first time in a while. Wednesday was the one warm day, and the kids, my mother-in-law and I took a nice walk. Also on Wednesday, I broke down and took my daughter to Kids’ Kuts for a haircut, rather than cut it myself. I just couldn’t envision her sitting still for me. Yesterday, my daughter and I trekked up to the avenue to visit our favorite spots: The Nesting House, where I dropped off some shoes for credit; Duck Duck Goose, where my daughter played while I eavesdropped on other mothers while pretending to be on my phone; Sara’s Produce, for the lime for dinner; and My Little Kupkake, because I couldn’t resist. I had to buy a bag of limes at the produce store, but that’s OK because it’s time for a new batch of homemade citrus vinegar cleaner. 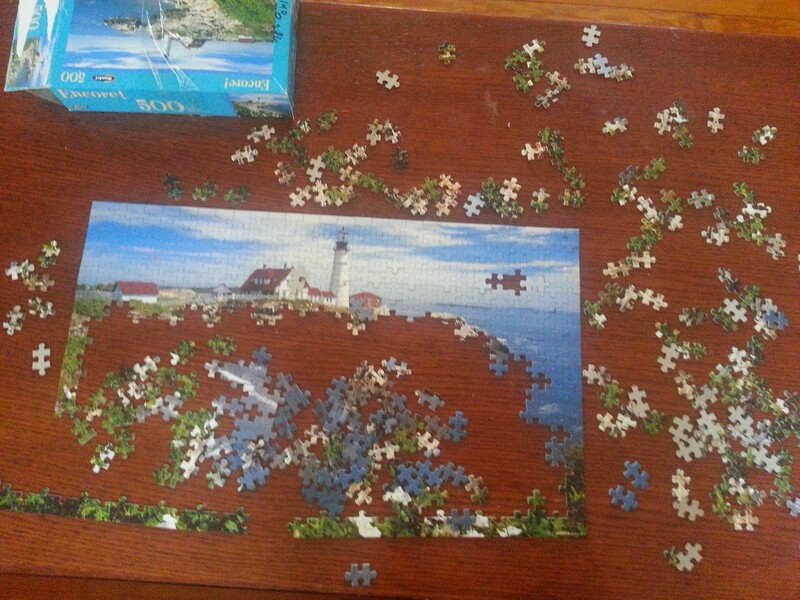 And in totally random news, my kids keep secretly destroying the jigsaw puzzle I’ve been working on since Christmas. Are they jealous of the time I’ve spent working on it? Well too bad, jerks, I’m just going to move it to a secret location! Drain and rinse the beans. Puree them in blender/food processor til they are mostly not chunky. 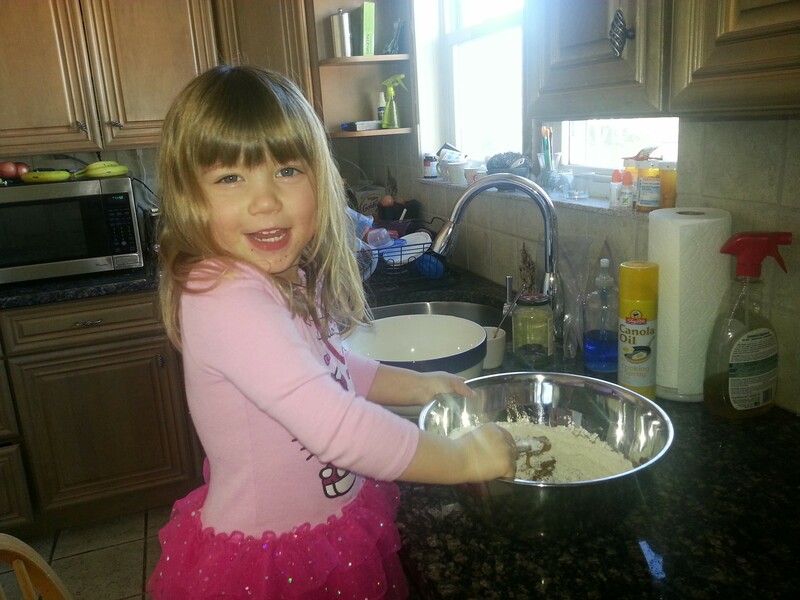 Put in a bowl and add other ingredients; stir. Add the lime juice slowly; you might not need it all. Let sit out for 30 minutes before eating. Yummy! You can add cilantro or carrots as I believe the original recipe called for, but I never do. Double the recipe for a crowd.